Sponsorship Statement: This supplement has been sponsored by Servier. BJC approached Servier with the idea for the supplement and Servier paid for the costs of developing this supplement including its writing, production and distribution. The company reviewed the document for medical accuracy but had no control or influence over the content. Conflict of interest: Dr Chris Arden has received honoraria for attending advisory boards and a research grant from Servier. Professor Kim Fox has received fees, honoraria and research grants from Servier. Dr Eddie Thornton-Chan has received research funding from Rhone-Poulenc Rorer, Sanofi-Aventis, the Medical Research Council and the Department of Health; educational grants from Abbott, Lederle, Wyeth and Servier; honoraria from the Greater Manchester & Cheshire Cardiac & Stroke Network; and received funding from Servier to run The Angina Clinic in Clarendon Medical Centre - no funding was received for the study reported. Mr Frederique Brigham and Dr Sarita Khandewal: none declared. The new guideline from the National Institute for Health and Clinical Excellence (NICE)1 covers adults who have been diagnosed with stable angina due to atherosclerotic disease, following on from clinical guideline 95,2 which advises on diagnosis of chest pain of recent onset. A key priority for implementation in the latest guidance is to ensure that people with stable angina receive balanced information and have the opportunity to discuss the benefits, limitations and risks of their treatment. Initial management of stable angina should be to offer optimal drug treatment, addressing both the angina itself and secondary prevention of cardiovascular disease. What constitutes this optimal medical treatment? Previous guidelines have suggested that beta blockers should be first-line treatment for stable angina, but the NICE guideline development group (GDG) could find no evidence to differentiate between the use of beta blockers and calcium channel blockers for this indication. The main outcomes evaluated were total and cardiovascular mortality and risk for myocardial infarction (MI) and stroke; measures of symptom severity were also included. The two drug classes were found to have similar effectiveness, similar adverse event rates and similar costs. However, randomised trials of these agents in stable angina have mainly used the older drugs in each class and relatively small numbers of patients, and data on long-term effectiveness are limited. The GDG felt unable to recommend any other agents as first-line monotherapy, suggesting that there is currently insufficient experience with the newer anti-anginal agents (nicorandil, ivabradine and ranolazine) and that the development of tolerance limits the use of long-acting nitrates. Clinicians may choose between beta blockers or a calcium channel blocker (no specific agent was preferred by the GDG) according to contraindications, any co-morbidity and the patient’s preference. Unfortunately, the guidelines take a totally pragmatic view of medical therapy and do not consider the underlying pathophysiological mechanisms that may apply to the selection of treatment. We believe this is a retrograde step to approaching pharmacological therapy: in current thinking medicine should be personalised if we are to achieve optimal and cost-effective treatment for our patients. If either beta blockers or calcium channel blockers are ineffective or not tolerated, then a switch to the other option was proposed. 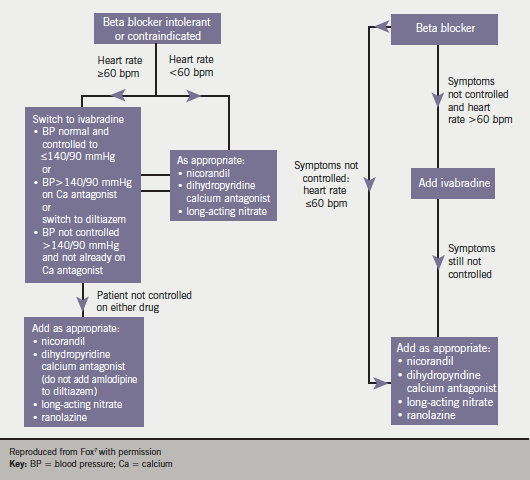 NICE goes on to consider whether addition of a beta blocker to a calcium channel blocker, or vice versa, improved symptoms or clinical outcome in patients with stable angina. The trials analysed to formulate such recommendations are all more than 10 years old with, again, a small number of patients, the most recent being Pehrsson 2000 (which compared atenolol or amlodipine against both).5 The GDG found no reason to recommend that patients whose symptoms were controlled on one drug should be given the other in addition, saying that the only benefit observed with combination of agents from the two drug classes was a short-term improvement in exercise tolerance. If the two classes are combined, then a dihydropyridine calcium channel blocker should be used with a beta blocker. Is there any advantage to the patient in adding a third anti-anginal agent? To address this question, the GDG studied the ACTION trial (published 2004),6 which reported the effects on mortality and outcomes, such as acute MI, new heart failure and stroke, from adding nifedipine GITS to usual anti-anginal treatment (this was a beta blocker in 79% and an organic nitrate as required [56%] or daily maintenance [37%]). They also looked at evidence from trials of newer anti-anginal agents such as nicorandil, ivabradine and ranolazine. The GDG were unconvinced that routine addition of nifedipine GITS to standard treatment conferred any major clinical benefit, and recommended that a third anti-anginal drug (this advice includes the newer agents) should not be offered routinely to people whose symptoms are controlled on two anti-anginal drugs. A therapeutic trial of a third drug could be considered in certain people: these are patients in the problematic position of having symptoms not controlled on two anti-anginal drugs and who are either waiting for revascularisation or whose disease is considered inappropriate or unacceptable for revascularisation. What is the place of ivabradine, nicorandil and ranolazine in the new NICE guideline? There are two recommendations for their use. Second, it is suggested that these newer agents may be used for people on beta blocker or calcium channel blocker monotherapy whose symptoms are not controlled but for whom the other (beta blocker or calcium channel) option is contraindicated or not tolerated. Nicorandil does not at present have UK marketing authorisation for use as an add-on therapy in angina and therefore informed consent should be obtained and documented. When ivabradine is combined with a calcium channel blocker, then a dihydropyridine (such as slow-release nifedipine, amlodipine or felodipine) should be used. Ivabradine lowers heart rate at rest and during exercise. It acts by selectively inhibiting the Iƒ current, an ionic current across the sarcolemma in cells of the sinoatrial node. The GDG reviewed trial data of its clinical and cost-effectiveness. Ivabradine was compared to placebo in two studies – by Borer et al (2003)8 and Fox et al in BEAUTIFUL (2009).9 The former study showed dose-dependent improvements in exercise tolerance and time to development of myocardial ischaemia during exercise in patients treated with ivabradine compared to placebo. The BEAUTIFUL trial assessed the effect of ivabradine in 10,917 patients with coronary artery disease and impaired left ventricular function. Limiting angina symptoms were identified in 13.8% of the total trial population at baseline: of these, 734 were randomised to ivabradine and 773 to placebo. There appeared to be a statistically significant difference between ivabradine and placebo for the primary end point of cardiovascular death or hospitalisation for MI or heart failure (HR 0.76, p=0.05), but no difference for all-cause mortality (hazard ratio [HR] 0.87, p=0.41), and cardiac death (HR 0.72, p=0.40); no statistical difference was found in terms of hospitalisation for heart failure (HR 0.84, p=0.45) or hospitalisation for MI or unstable angina (HR 0.9, p=0.58) but there was a statistically significant difference found in terms of hospitalisation for myocardial infarction (HR 0.58, p=0.021). The GDG took the view that since this subgroup was defined retrospectively, it only included 13.8% of the total trial population and lacked statistical power for the primary end point; the analysis did not provide definitive evidence of benefit for ivabradine. Ivabradine was compared against atenolol in a study by Tardif (2005):10 total exercise duration, time to angina onset, number of angina attacks and short-acting nitrate consumption were similar in both treatment groups. Tardif also (2009) compared ivabradine plus atenolol (n=441) against atenolol plus placebo (n=434) in a randomised controlled trial (RCT) with follow-up to four months.11 Results were significantly better in the group treated with beta blockers and ivabradine at four months with respect to total exercise duration at trough, time to angina onset at trough and time to 1 mm ST-segment depression, although the rate of adverse events was also higher in this group. In one RCT considered by the GDG (Ruzyllo 2007),12 ivabradine was compared with amlodipine. The two agents appeared comparable for the measures of efficacy that were evaluated – total exercise duration, time to onset of angina at trough, number of angina attacks and consumption of short-acting nitrates. The GDG summed up by stating that “the data suggest that ivabradine is an effective anti-anginal agent with comparable short-term efficacy to atenolol and amlodipine”. However, they drew attention to the significantly higher rates of adverse events in patients treated with ivabradine, including visual symptoms. Data to confirm the efficacy and safety of ivabradine in the long term were limited, they felt. Evidence for the use of ranolazine in stable angina was reviewed. The mechanism of action of this drug is believed to be selective inhibition of late sodium influx across the sarcolemma, which attenuates the abnormalities of ventricular repolarisation and contractility associated with myocardial ischaemia. Decreases in heart rate (and systolic blood pressure) are minimal with this drug. No pro-arrhythmic effects were observed in the MERLIN-TIMI 36 study (n=3,162)13 but ranolazine has the potential to prolong the QT interval. The main studies identified were CARISA,14-16 which evaluated ranolazine plus anti-anginal treatment against placebo plus anti-anginal treatment, and ERICA17 which evaluated ranolazine plus amlodipine against amlodipine alone. In CARISA, patients treated with ranolazine had significantly better exercise duration and time to onset of angina, and fewer angina attacks. In ERICA, weekly consumption of short-acting nitrates was significantly lower in patients who received ranolazine plus amlodipine versus amlodipine alone. The GDG stated that the improvements in exercise time and symptom severity associated with short-term ranolazine treatment were modest and of uncertain clinical significance. They were unable to recommend routine use of ranolazine but considered that it had a role in limited circumstances (see discussion above). The basis of myocardial ischaemia and development of angina is an imbalance between oxygen demand and supply. In patients with stable coronary artery disease, most episodes of exercise-induced ischaemia are preceded by a heart rate increase. The extent of myocardial ischaemia is related to baseline heart rate and the magnitude and duration of this increase.18 Studies have found a continuous increase in cardiovascular risk with heart rate >60 bpm: it is therefore desirable to consider heart rate reduction as paramount in the treatment of angina. Our own algorithm (figure 1) for the management of angina in primary care is an alternative approach to the medical treatment of anginal symptoms,7 which is equally appropriate in the initial treatment of angina in the secondary care setting. The recent NICE guidance says: “Angiography may be offered to guide the treatment strategy for patients whose symptoms are not controlled with optimal medical treatment”. The issue of revascularisation, i.e. percutaneous coronary intervention (PCI) and coronary artery bypass graft surgery (CABG), where symptoms are not satisfactorily controlled with optimal drug treatment, is reviewed in detail in some 47 pages of the full NICE guideline. Regular multidisciplinary team meetings should discuss the risks and benefits of medical and revascularisation strategies. The GDG concluded that there is no definite evidence that one revascularisation strategy confers a prognostic advantage, although CABG provides slightly better angina relief than PCI, over the medium term, and there is a potential survival advantage with surgery for some people with multi-vessel disease e.g. in those with diabetes, those over 65 years or in those who have anatomically complex three-vessel disease with or without left main stem involvement. The reader is referred to the guideline for full discussion of revascularisation and other recommendations, which have particular relevance for secondary care. These include: clinical risk scores, such as ACTION and the Euro Heart Angina Score, not being recommended; routine functional testing not found to be cost-effective; and lack of evidence that rehabilitation programmes are clinically or cost-effective in the management of stable angina. National Institute for Health and Clinical Excellence. NICE clinical guideline 95. Chest pain of recent onset: assessment and diagnosis of recent-onset chest pain or discomfort of suspected cardiac origin. London: National Institute for Health and Clinical Excellence, 2010. www.nice.org.uk/guidance/CG95. Pepine CJ, Handberg EM, Cooper-DeHoff RM et al. A calcium antagonist versus a non calcium antagonist hypertension treatment strategy for patients with coronary artery disease. INVEST, a randomized controlled trial. JAMA 2003;290:2805–16. Pehrsson SK, Rinqvist I, Ekdahl S et al. Monotherapy with amlodipine or atenolol versus their combination in stable angina pectoris. Clin Cardiol 2000;23:763–70. Poole-Wilson PA, Lubsen J, Kirwan B et al. Effect of long-acting nifedipine on mortality and cardiovascular morbidity in patients with stable angina requiring treatment (ACTION trial): randomized controlled trial. Lancet 2004;364:849–57. Fox K, Arden C, Begg A, Fuat A, Hall AS, Knight C. Consensus guideline for the management of symptomatic stable angina in primary care. Guidelines 2010; (Suppl):1–8. Ruzyllo W, Tendera M, Ford I et al. Antianginal efficacy and safety of ivabradine, compared with amlodipine, in patients with stable effort angina pectoris: a three-month, randomized, double-blind, multicentre, noninferiority trial. Drugs 2007;67:393–405. Stone PH, Gratsiansky NA, Blokhin A et al. Antianginal efficacy of ranolazine when added to treatment with amlodipine. The ERICA trial. J Am Coll Cardiol 2006;38:566–75.